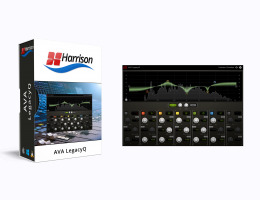 The new AVA LegacyQ is a plug-in version of Harrison's original MPC digital equalizer, it began life as a digitally-controlled analog circuit and was later adapted to digital while being used in ultra high-end post & film facilities worldwide. The results are quintessentially "Harrison", effortless, smooth and transparent! Minimum Specifications are suggestions only, and may change at any time. Please see here for latest detail. We highly encourage you to try the free DEMO below to determine if the plug-ins work on your setup. Mac OSX: 10.6 or newer required. 10.10 or newer suggested. Windows: Win7 or newer required. LegacyQ is available in the following formats for Mac, Windows and Linux respectively: AAX, AudioUnit, VST, VST3. Pro Tools: 10.3.5 or newer required. Enable the AAX format during installation. Logic: Enable the AU format during installation. Cubase: Enable the VST and/or VST3 format during installation. Most other workstations: Enable the VST format during installation. Download & Try LegacyQ. This will ensure the software is fully compatible with your computer's environment prior to purchase. In Demo mode, the AVA plug-in control panel will become unresponsive after a few moments. You will need to purchase a license to permanently enable the control panel.